A new heaven and a new earth. TiS 663 / NCH108 / CH241 / VU680 / GtG077 / PH337 / W&R532 Isaiah the prophet has written (Patterson) Excellent words of Isaiah's vision for the future; I prefer to sing this to the tune JUDAS AND MARY (this is not the set tune in TiS). Lyrics (note: a different tune). New words to old(ish) tunes. *UMH729 / VU682 / LBW161 / WoV762 / ELW627 / GtG373 / PH450 / CP573 / W&R539 / Cha711 / URW140 / 82Hml-597 O day of peace that dimly shines (Daw) A song of hoped-for peace. 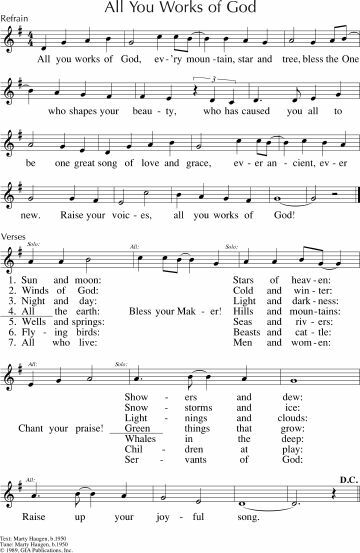 The tune in Chalice hymnal is really nice (CANDLER) or O WALY WALY which is used in URW. Other sources use JERUSALEM, which is a bit too militaristic for me. Lyrics and JERUSALEM sheet music. New words to old tunes. Tune In: Making things new (Sheree Anderson). A groovy one. Great for kids, and lots of fun. Sound sample, lyrics and songbook. Good for kids. AoV2-007 / AoVNG110 See I Make All Things New (O'Brien, Watts) I really love this song. “New, as night turns to morning, the spirit is calling I’m with you, I make all things new”. A nice sound sample. *AoV2-085 / Iona (T1AU) / MV115 / A&M328 / SP129 Behold behold I Make All Things New (Bell) A nice hopeful upbeat short song. Highly recommended. Sound sample (scroll down) Good for kids. W&R27 God of Creation All-Powerful (Clarkson) Good solid words to a well known tune (SLANE). Sound sample and lyrics. New words to old tunes. 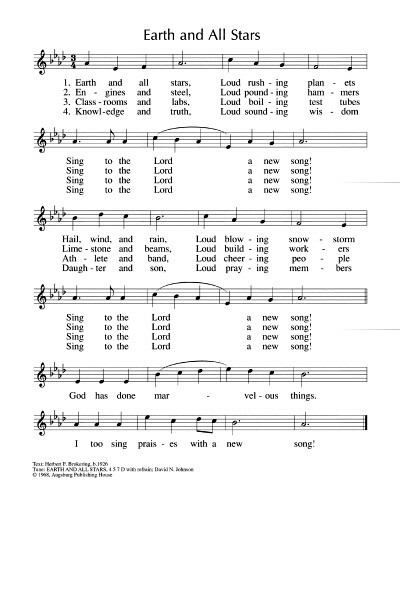 Online resource: Behold I make all things new (Harding) A nice short song with a folky feel. Sound sample. Sample sheet music. Purchase here. Cha658 / URW081 Restless Weaver (Harrison) Excellent words of our desire to help build God's new earth - caring for creation and desiring justice for all. Sung to the familiar tune HOLY MANNA. Lyrics. New words to old tunes. More singing praises to God. Trust. NCH107 / LBW633 / ELW242 / GtG107 / GC346 / GC(II)351 / G(3)423 / W&R160 / Cha138 / Lau157 Awake Awake and greet the new morn (Haugen) Joyful song! Sheet music samples. *Taizé / AoV2-109 / CH772 / GA429 / GtG654 / A&M334 / SFFS 2195 / G(II)396 / GC566 / GC(II)546 / G(3)639 / SP128 / URW381 / Lau944 / W&R448 In the Lord I'll Be Ever Thankful / El Senyor (Berthier) A joyful and bouncy Taize song. Works well in English, German and Spanish at least. Good for kids. Sheet music, translations into many other languages, sound samples. G(II)129 / GC148 / GC(II)81 / Lau399 Cry out with joy and gladness / With Joy you shall draw water (Haugen) A nice arrangement of this reading. The tune is really similar to "Let us build a house", so maybe it would be confusing? It's very straightforward to sing. Lyrics, sheet music sample, sound sample. *MV222 May the peace of God be your peace (McLaren) A lovely benediction. Will need to be taught first. AoV1-072 / GA341 / A&M191 / SP74 / Lau692 We Shall Draw Water (Inwood) Cantor and congregational refrain. Quite nice. *ATW 435 Like the woman of old / Wellsprings A favourite song in our congregation about going to the "Wellsprings of life"and finding Jesus there. Picks up themes of tiredness, broken hearts and weariness, but makes the point that it's worth the effort. It's not specifically related to this reading, but would probably work quite well. The bad will be burned away, the righteous will rise. Sounds like John the Baptist, but it's a little early. BUC Song Project In Spirit we rise (Anderson) It would be great to sing this song about God's spirit working in and through us. "In Spirit we rise, rise, rise, to be bread for the world". Sorry, this isn't available yet online or in a songbook. Online Resource Shout for joy! 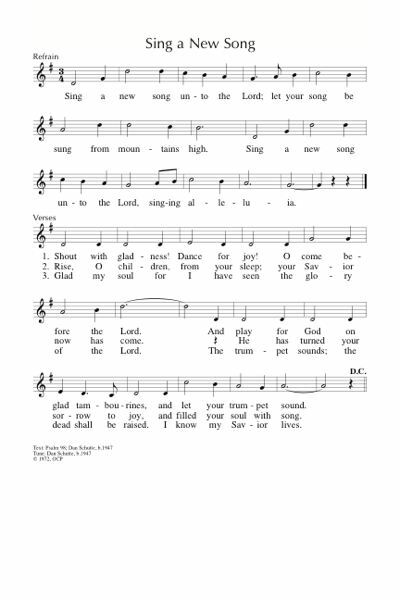 (Bruxvoort-Colligan) A happy rocky song based on this Psalm. Good for kids. Sound sample, lyrics and purchasing options. Sheet music. *TiS 166 / AHB 102 / GA398 / StB035 Sing a new song sing a new song Excellent inclusive words from Australian poet James McAuley. The last verse annoys me a bit, but the rest is excellent. Lyrics. AoV2-143 / GA057 / G(II)86 / GC1 / GC(II)55 / G(3)70 / Lau121 All The Ends Of The Earth (Haugen/Haas) Good refrain; verses require a good cantor, or a reader. Not entirely inclusive. Lead sheet and lyrics. Sound sample. 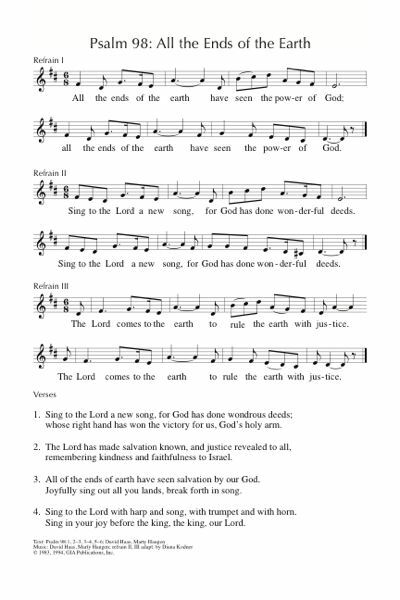 PH274 O God of Earth and Space (LEONI) Terrific words by Jane Parker Huber to a well known Jewish hymn tune. "Wherever freedom reigns, where sin is overthrown, Where justice fused with mercy rules, there you are known. Give us the courage clear, to make the earth a home, For all to live in harmony, in Christ’s shalom." Highly recommended. Lyrics. 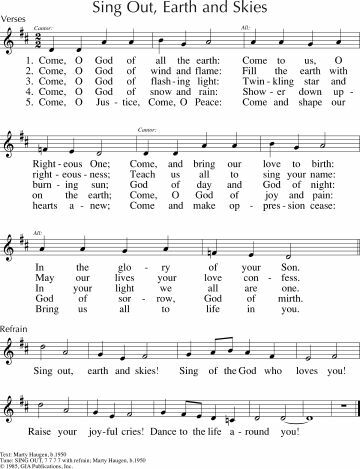 TiS 181 / AoV2-032 / GC(II)497 / G(3)577 / CP589 Come O God of all the earth / Sing Out Earth and Skies (Haugen) Another big favourite. Sheet music, lyrics. Sound sample. TiS 72 / AHB 42 / NCH27 / CH146 / UMH101 / LBW550 / A&M637 / HPP36 / GtG327 / PH229 / CP344 / CP(E) 431 / Cha49 / PfAS117C / 82Hml-380 / StF075 From all that dwell below the skies (Watts) A very old hymn, known by many, which is entirely inclusive in its language for God, save for one Lord which you can replace with God if you like 'cos it's Public Domain! Oldy-but-a-goody. Lyrics and tune samples. *AoV1-019 / CH151 / GA397 / G(II)340 / GC493 / GC(II)498 / G(3)575 / W&R039 All You Works of God (Haugen) Joyful cantor and response. If your musicians have any energy left after Christmas, they might enjoy playing with this. Probably good for kids. Lead sheet and lyrics. Silly sound sample. VU888 / LBW558 / ELW731 / GtG026 / PH458 / RS681 / CP358 / W&R642 Earth and All Stars Fun words of cosmic praise. An easy hymn-like tune. I really like the "boiling test tubes" bit, although this verse is not in all hymnals. Lead sheet. Sound sample. ATE 216 / Iona (SBL) / CH126 / StJ / ELW555 / PH472 / G(II)365 / GC527 / RS 671 / CP417 / W&R15 / StF042 O sing to the Lord / Cantai ao Senhor / Cantad al Señor (Traditional Brazilian) A good, fun and simple song that is easy to learn in Portuguese or Spanish too; note that not all versions are inclusive. Sheet music samples. Good for kids! AoV1-080 / ATA 150 / GtG276 / G(II)384 / GC538 / GC(II)544 / G(3)607 / URW296 / Lau697 Sing a New Song Unto the Lord (Schutte) Good, joyous words and a simple joyous tune. It is not inclusive in all sources. Lead sheet and lyrics. Sound sample. Don't be idle. Don't get weary of doing what's right. NCH089 / 82Hml-009 Awake awake to love and work (Studdert-Kennedy) This song is one of my all time favourites. Easy to sing and wonderful words of getting up and getting going in doing what's needed. I especially like the 3rd verse. Sung to the familiar tune MORNING SONG. Older-style lyrics. New words to old tunes. TiS 571 / AHB 480 / CH529 / UMH438 / VU416 / A&M476 / CP467 / CP(E) 430 / W&R718 / Lau861 Forth in thy name O Lord I go (Wesley) A nice old minstrelly tune, and timeless words about committing all our works to God. I'm listing a lot of old hymns this week! Lyrics. Oldy-but-a-goody. Recorded Music Hammer and a Nail (Indigo Girls) This song is a good song to stop people from overthinking and spur thinkers into action, or at least into thinking about action. Lyrics. Video. AoV2-033 / VU648 Travel on travel on (Sydney Carter). I think this old folk song would work well to pick up the theme of "pressing on". Lyrics and chords here. TiS 666 / AoV2-113 / AoVK-126 / ATOK 409 / NCH526 / Iona (Common Ground, Freedom is Coming) / CH516 / VU646/647 / WoV650 / ELW866 / A&M483 / SFFS 2235 / HPP153 / GtG853 / G(II)357 / GC513 / GC(II)516 / G(3)594 / Cha442 / SP235 / Srce737 / StF483 / MP954 We are marching in the light of God / Siyahamba / Caminando (South African) A very popular chorus, with possible alternate verses, depending on your source. Sometimes people get anxious about the word "marching", but remember that this song comes from apartheid-era South Africa, where people were protesting so that they could vote in their own country. Good for kids. Jesus predicts the temple's destruction, persecution, war and endurance of the disciples. *MV139 True faith needs no defence (Damon) Simple, slightly celtic tune, and lovely words. Highly recommended. TiS 123 / AHB 48 / NCH488 / CH691 / UMH534 / VU652 / A&M594 / GtG819 / CP(E) 384 / W&R451 / Cha 566 / Src69 / Lau780 Be still my soul Sometimes this can be a bit mushy, but the words are really very strong and helpful. Lyrics and sound sample. Oldy-but-a-goody. ATW 463 / Iona (T1AU) / ELW721 / SFFS 2219 / A&M835 / GtG750 / GC(II)451 / G(3)528 / W&R296 / URW436 Goodness is stronger than evil (Tutu / Iona) Words from Archbishop Desmond Tutu. "Victory is ours, victory is ours, through him who loves us". Some congregations change the last line to "Compassion is ours, compassion is ours...". It depends on the context in which you sing it, I suppose. Sound sample. Good for kids. Iona (LFB) / G(II)407 / GC583 God give us peace that lasts (Bell) Lovely words and a simple hymn tune. Prayer for peace, hope and love. This can also be sung to LOVE UNKNOWN. "God give us peace that lasts, not through the fear of might, but through the force of love, and love of life and right. Where costly wars and weapons lure, Show us our Lord among the poor". 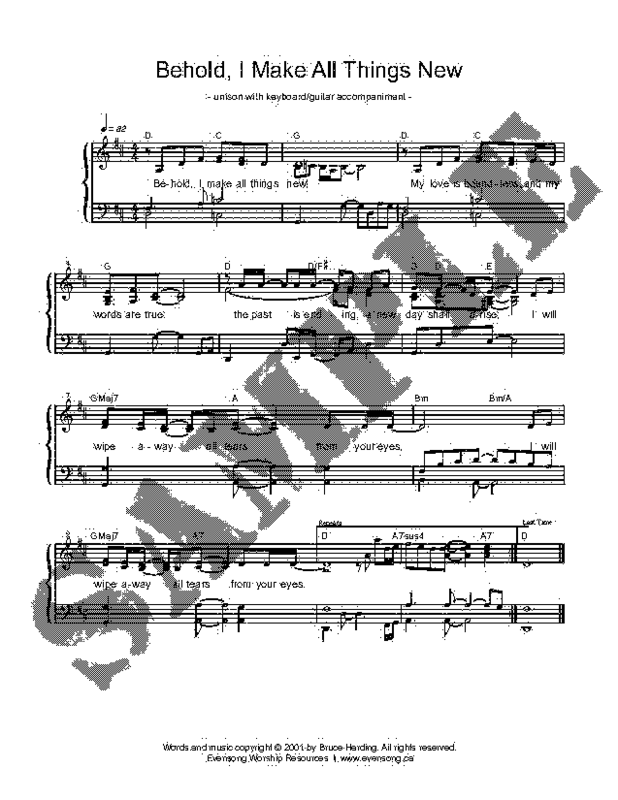 Lyrics, sound sample and sheet music (search for "Gifts that Last") New words to old tunes. BUC Song Project Come out and shout (Brown) It would be good to sing this song again, and it would be a joyous ending song for this reading. "No more need to fear and start to run, and I will give you strength". *GC(II)651 / G(3)755 / Online Resource You must never give up / Sizo Bambelela (South African) An excellent song! Would be fun to get a few singers together to sing the parts to this, though maybe not as many times through as in the sound sample. Sound sample. Good for kids. Have I missed a song you would like to share? Please join the conversation by adding a comment.